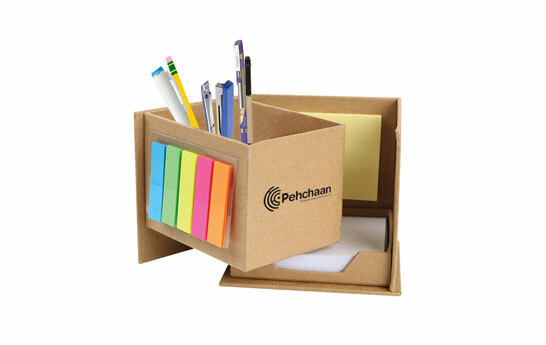 Kraft Table Organizer Kit Consisting of a Pen Stand, Sticky Notes, Page Markers and Paper Notes is made of Thick Kraft Paper. Its Cube Shaped with an Open Top. Of the remaining 5 Sides, only the Side opposite to the Page Markers is Completely Customizable. You can customise this Open Top Cube Shaped Kraft Table Organizer with your Brand Logo, Illustrations or Quotes.